Upon hearing the news that Super Smash Bros. Ultimate would see the return of every single Smash fighter in the series history, we figured it’d be good to start putting together guides on each one. In this Super Smash Bros Ultimate Diddy Kong Guide, we’ll detail everything there is to know about Diddy Kong. 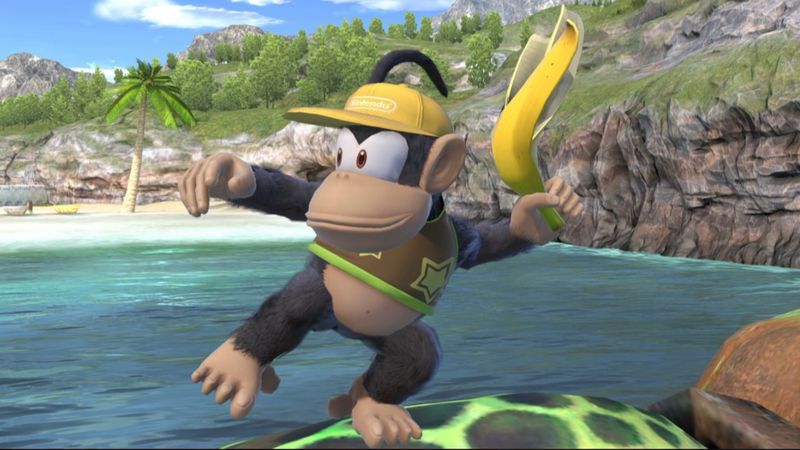 We’ll look into the changes that have been made since his last appearance, what his Final Smash is this time, and also what Alternate Costumes are available for Diddy Kong. Throughout the table below, you can find a list of Diddy Kong’s moves in Super Smash Bros. Ultimate. 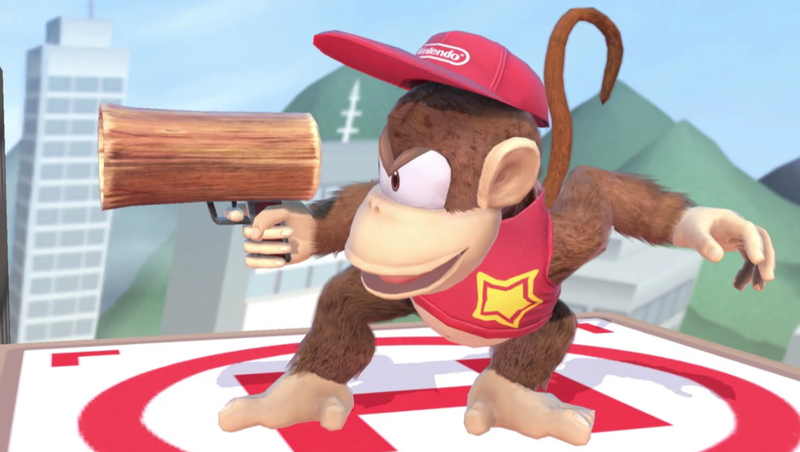 There’s also Diddy Kong’s Final Smash move, called Hyper Rocketbarrel, where he takes off around the screen. Diddy Kong handles a little differently this time around. There have been a number of changes since his last appearance, with subtle tweaks being made to the majority of his moveset. He’s also got a brand new Final Smash to use. Let’s take a look at what changes have been made since SSB4. Several animations have been altered including Banana Peel, jumpsquat, and Neutral Attack. Diddy has a new Final Smash, more on that later. Facial animations are more expressive. 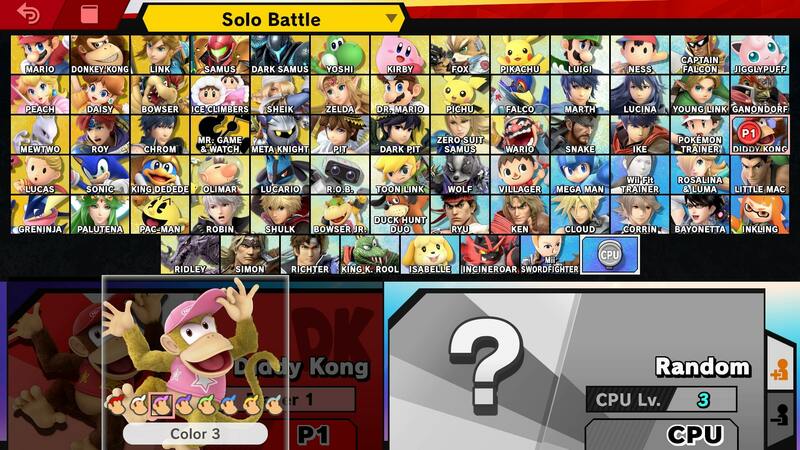 Diddy Kong is no longer a starter and must be unlocked before use. The Banana Peel attack has more range. Much like the rest of the Super Smash Bros Ultimate roster, Diddy Kong has a few Alternate Costumes for players to choose from. They are mostly color swaps of his hat and tee shirt in yellow, pink, purple, green, blue, and light blue. There’s also a Diddy variant that has black fur, which is shown in the image embedded above. Diddy Kong has a brand new Final Smash in Super Smash Bros Ultimate. It’s called Hyper Rocketbarrell. It is slightly different to his previous Final Smash, in that he dons a jetpack and zooms around the stage bumping into his opponents. He then does a targeted punch and lands. That’s everything we know about Diddy Kong in Super Smash Bros Ultimate. We’ll be adding more info as we get it, but in the meantime you can head over to our Super Smash Bros Ultimate Guides Hub for more info on the game.